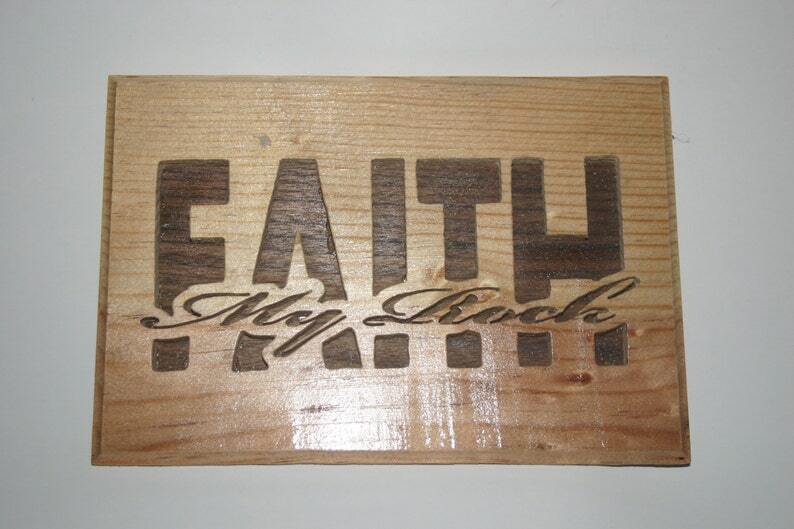 The My Rock in Faith word art is a faith inspirational scroll saw cut out is a great way to help develop strong faith, and a family inspiration that can be displayed as a declaration of the strength of your faith for all to see. This religious word art is a reminder keep your faith strong. Designed as a play on words and positioning. The My Rock is cut and surrounded by the word Faith, hence My Rock -in- Faith, to promote and help with those struggling with thier faith in God. This was designed and cut out by hand and cannot be exactly reproduced making it a true one of a kind. The faith wall hanging was sanded and finished using an acrylic finish giving it a clean and durable finish while adding strength to the over all design and allowing the natural grain and color of the wood to show through. The backing is a african mahogany veneer. The piece is fitted with a saw tooth hanger for ease of postitioning. The faith wall decor is just over 8 1/2 inches wide and 5 1/2inches tall and is about quarter of an inch thick. This candle set turned out exactly how I wanted it! Can’t wait to light them at our wedding. Thanks so much!